One of the definite achievements of British film culture, typically not celebrated by the national UK media obsessed by success in Hollywood, has been the development of Regional Film Archives to complement the National Film Archive. The Yorkshire Film Archive is celebrating its 25th Anniversary and it has recently merged with the North-East Film Archive to preserve a total of 50,000 film titles across the two regions. Several thousand hours of film, now part of the collection, came from a Bradford photography and film company set up by C. H. Wood which operated over eight decades before closing in 2002. The event at BIFF was presented by Graham Relton of the Yorkshire Film Archive who introduced a selection of clips across the range of productions completed by the company. The two sons of C. H. Wood who effectively ran the company from the 1960s onwards were in attendance. I arrived late for the show and discovered a packed Pictureville Cinema with around 300 in attendance. I was lucky to eventually find a seat and although I missed a couple of clips, I’m sure I saw enough to appreciate what a terrific event this was. 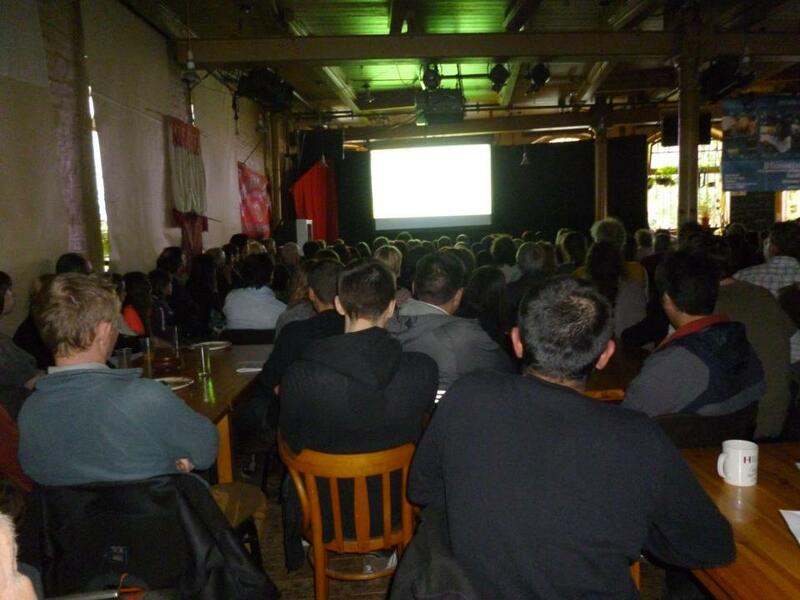 I should have guessed that there would be a large audience – my previous experience of these kinds of archive screenings has always been very positive in terms of audience reactions. We watched an extract from Crikey! (1947) a comic sequence from a film about Bradford’s traffic taken from a Road Safety film. Later we saw a 1980s public announcement film about the Green Cross Code with David Prowse (aka Darth Vader). C. H. Wood was well-known for aerial photography (and helped train photographers in the Second World War) but one of the main types of films made in the 1940s and 1950s were concerned with motor sports including motorcycle trial racing on the moors (this part of Yorkshire has produced world-class trial riders) and also Formula 1. We watched clips from the first win by a British Vanwall car driven by Tony Brooks and Stirling Moss at the 1957 Grand Prix held at Aintree, Liverpool – with pistons designed and produced by a Bradford firm! Other clips took us on a Wallace Arnold bus excursion and showed us all the various sports featured at Bradford’s famous Odsal stadium, the enormous arena that once reportedly held over 100,000 fans for a Rugby League Challenge Cup Final replay in 1954. Shooting motorcycle trials. Image from the C. H. Wood collection at YFA. My two favourite clips were from a ‘works outing’ documentary and a corporate film for Lister, the Bradford textiles company. The works outing was from Salts Mill to celebrate 100 years of operation in 1953 and the large party took a railway excursion to Blackpool for the day. I now frequently visit Salts Mill and in 1953 I was a small child living in Blackpool, so this was a very personal viewing for me – and that is what archive film is often about. What was remarkable was the high quality of the camerawork and editing. Graham Relton told us that C. H. Wood became something of a ‘holder’ of films produced elsewhere in the city and this seems to be one of those films. We don’t know who operated the camera or who did the editing. In 1953 the 16mm cameras was an expensive piece of kit and the camera operator must have been trained. You can see the whole film (and others mentioned here) on the YFA website. What do you think of the footage? The Lister’s film struck me as very revealing. The mill, a replacement for an earlier mill destroyed by fire in 1871, was the largest in the North of England. The Samuel Lister company was one of the major silk textiles companies in the world and Lister was a major innovator, especially in the production of velvet. The C. H. Wood film is a corporate promotion for the company. It reveals that everything in the production process was contained within the mill – which at one time employed 11,000 workers. We saw parts of this process, including the weaving of velvet and the testing of new dyes produced in the company’s own laboratories. In 1976 the company supplied velvet curtains to the White House. The business began to decline rapidly in the 1980s and the mill finally closed in 1992. I realised as I watched this colour film made in 1955 (30 mins with sound) by C. H. Wood just how much Bradford has lost because of the decline of the textiles industries in West Yorkshire. It wasn’t just the jobs in spinning and weaving, but all those technician jobs in the laboratories – and the associated engineering jobs. At the end of the event David Wood answered questions from the audience, finishing by pointing out that the National Media Museum had been in Bradford for nearly 30 years and this was the first time he’d seen his films on the Museum’s screens. It’s good that omission has been put right and another similar event would be a good idea in future years. Meanwhile there is another opportunity to see archive films ‘made in Bradford’ on Friday evening at the Cathedral. There will be a posting on that event as well. The ‘no-man’s land’ where the olive trees were. The black objects on the ground, shaped like light-bulbs, are Israeli tear gas cartridges. Five Broken Cameras is an engaging and well-made documentary. It’s affective in making us feel the emotions of the filmmaker who was compelled to complete it and it deserves the praise it has received and the audience interest it has attracted. The events it portrays are shocking and in a civilised world they would be one of the catalysts for change. But we don’t live in a civilised world and as yet there seems little sign that enough people in a position to change things have the courage to carry out changes. Five Broken Cameras is a certain kind of documentary and that may also be part of the problem – though it shouldn’t necessarily be so. I’ll try to explain what I mean. The cameras of the title were each used by a Palestinian farmer to document the theft of his land by Israeli settlers illegally occupying territory in the West Bank to the west of Ramallah from 2005 onwards. The film doesn’t attempt to fill in all the history or to run through all the questions surrounding the Occupation of Palestine and the building of settlements which contravene international law as well as being (as in this case) illegal under Israeli law. Instead, it appeals directly to the viewer in terms of the obvious suffering of the Palestinians when they try to resist the bulldozers which uproot their olive trees and the Israeli soldiers and police who attack them with tear gas, arrest them and occasionally kill them during attempts to squash their protests. Emad Burnat, the farmer at the centre of the film and the co-director (as well as the principal cinematographer, using the five cameras) was himself wounded and arrested and recorded the arrest of each of his brothers and the death of one of his comrades in the village during their protests. The co-director, writer and co-editor of the film is Guy Davidi, an Israeli filmmaker who trained partly in Paris and who lived in the Palestinian village of Bil’in for three months in 2005 when Emad began filming. But just as the film doesn’t elaborate on the history and politics of the situation, it also doesn’t explain/explore the Israeli support for the village protests – i.e. the Israeli activists who fight against the Occupation. They are shown and occasionally referenced but not in any detail. The same goes for the international supporters who travelled out to the West Bank to show solidarity. I’m not suggesting that there is anything sinister in this, but that it adds to the overall feeling that this is a very ‘personal’ film about a man and five cameras (each of which is damaged during the filming or deliberately smashed by Israeli soldiers). I suspect that this ‘personal’ approach has helped the film reach a wider audience, especially in North America, and it has been nominated for ‘Best Documentary Feature’ at the 2013 Oscars. What is slightly sinister is the film’s depiction of the settlers – Orthodox Jews who are perhaps the least ‘humanised’ by the camera’s gaze. The Israeli settlers seen here trouble me deeply – I can’t think of anything about them that would attract my sympathy – but I don’t want to feel that way about anybody and I wonder if the filmmakers’ decision not to invite them to speak or not to attempt to present their perspective, somehow damages the strength of the film’s polemic. I’m not asking for ‘balance’ – the settlers are in the wrong, that’s the starting point. But we’ve got to try to treat them like human beings, otherwise they are trapped behind their fences in the same way that they have deliberately put the Palestinians behind a fence/wall. Emad states at the beginning of the film that he is a ‘fella’ – a peasant attached to his land. The rough land which supports only olive trees and a few sheep/goats has been the property of the families in the village since before anyone can remember. The sight of bulldozers digging up the trees or the sheer vandalism of setting the trees on fire, even before the barbed wire has staked out the land grab by the settlers, is contrasted with the almost comical tree-hugging of one of the villagers. This is one of the most affecting shots in the film. The destruction of Palestinian olive groves is perhaps the most powerful symbol of the Occupation alongside the Dividing Wall. The one absolute plus of the film is that it celebrates the resistance over five years of the whole community in Bil’in. I’m sure that’s what stayed with the sizeable audience in the cinema. I hope the film wins the Oscar, if only because that will help more people to see the film. The more exposure that these stories get, the more chance we have of putting pressure on the Israeli government. There is one scene in the film in which we watch someone from the Israeli security forces deliberately shoot a protestor in the leg from only a few yards away. I wonder if the offender was brought to justice? Director Richard Wolf has produced more than 30 documentary films in his career, many for international television networks (CNN, BBC, etc.). Much of his work focuses on the plight of women in third world countries. As he puts it the, “humanistic values that are deeply reflected in our films… are simple yet gripping because they tap into universal emotions.” In short, Wolf’s vision touches the heart. But his 2008 film,Women of the Sand, enthralls the eyes, the mind and the soul as well – at least according to the selection committee for Museum of Modern Art (MOMA) in New York. Last year, the film became one of the select few to enter the museum’s permanent selection – and for good reason. Women of the Sand focuses on the women at the heart of communities of Islamic nomads in the Sahara Desert, specifically in Mauritania. An unmitigated, cinéma vérité experience of the women’s daily routines, carries filmgoers into the meager existence of this millennia-old culture and engages us in their struggle against growing desertification. The visuals are stunning – a sculptural contemplation of wind blowing across shape-shifting dunes that rise and drop. The occasional trees and bushes are as sparse as the humans who stand improbably against this arid climate. Those same winds also catch the thin fabrics of tents and lean-tos, and of the traditional fabrics worn by the men, women and children of these unsettled communities. Heads peaking out from inside their moulafas, the women tell their stories of survival in this harsh climate, of the challenges they navigate just to feed, cloth and educate their children. They also speak of the green plants that come forth in the rainy season – the basis of all that makes life worth living. Their focus is not on the dryness and the more frequent times when food is less plentiful, though to outsiders those stark climatic conditions make it impossible not to contemplate the fragility of life. These “women of the sand” are resilient people who speak of the friendliness of the desert and desert people. One woman says she prefers that to the coolness she observes between people in the cities she, evidently, has visited. We also learn that the desert expands by about six miles per year, challenging their beloved and centuries old nomadic ways. Over a lifetime, that means 360 more miles of largely barren sand will overtake arable land, making those green plants a sparser and sparser presence in their world. It is a losing battle against scarcity that drives more interaction with non-nomads, disrupting their way of life. Long term, it threatens to seriously diminish, perhaps even end the nomad culture. While MOMA selects films for its collection for a broad range of reasons, the unifying criteria, according to the institution’s website, is innovation. That innovation may come into play in the film’s structure, narration or in its success immersing the viewer in the subject. One particularly striking example ofWomen of the Sand’s immersive quality gives us real insight into the nomad’s experience of modernity: In a tent on a rug that are all that separates them from endless, depthless sand, flies walk on the women’s hands and wrists, as they type on the keyboard of a laptop computer with the same skill they later demonstrate creating traditional fabric on a loom. Technology may or may not be useful to them. One mother explains they do not consider it particularly impressive or important. But will their children – who attend school in a tent, seated on the ground, feel the same way? Through a string of such moments,Women of the Sand creates a compelling tension between its exploration of a vanishing way of life, and a simultaneously contemplation its abiding continuity. Produced by C. Litewski and Lucy Barbosa, directed by Richard Wolf, Women of the Sand is available on DVD (see below). 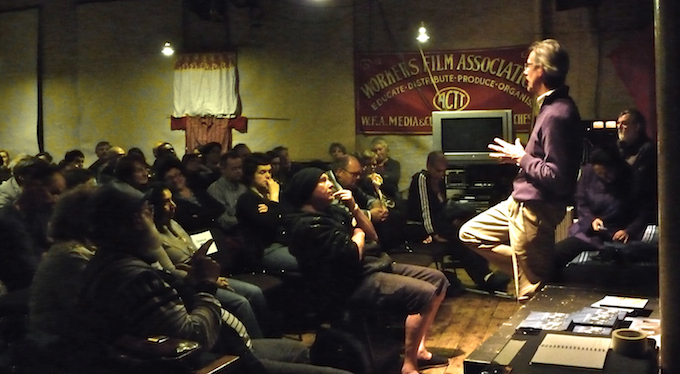 Wolf studied film direction at the New York Film Academy. He also studied documentary production at the Global Village School, also in New York. Part of his signature style is to blend very candid, personal one-on-one testimonies with monstrously out-proportioned imagery that is said to provide a global context to a very intimate story. The production company is Lobo Docs. Andrea Swift is Chair of the Documentary Program at the New York Film Academy. She earned her Masters in Fine Arts degree from Columbia University and was the executive producer of the ‘In the Life’ documentary series for the PBS network, among many other credits. 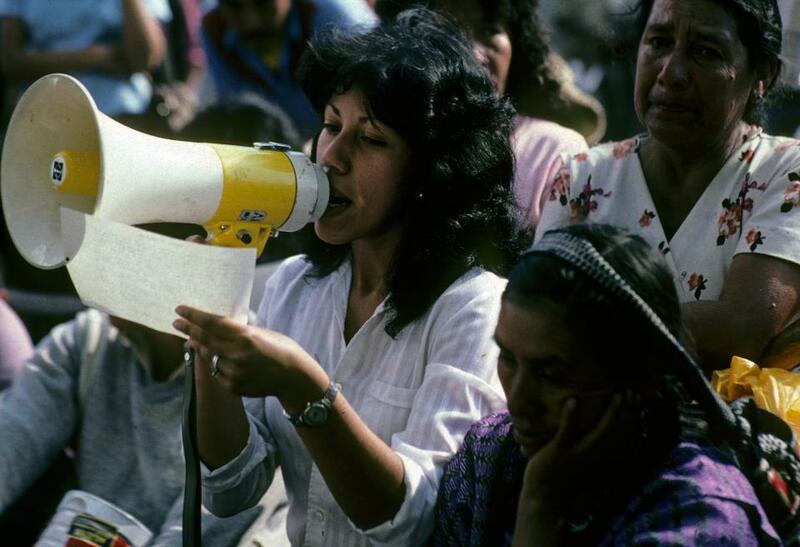 Her ‘nuclear folktale’ Deafsmith was featured at the United Nations Earth Summit, won a Silver at the Chicago International Film Festival and took second prize at the American Film and Video Festival. A free low resolution streamed presentation of Women of the Sand is available on SnagFilms (with some forced ad breaks). The film can be purchased from the same website on this page or downloaded/rented on this page. The DVD appears to be Region 0 and the film was made in 2003. I enjoyed the documentary very much, particularly because it wasn’t until the 1980s that I began to understand the importance of Belafonte as a political activist – and then it was in relation to the anti-apartheid struggle in South Africa and also Belafonte’s role as a producer in independent American cinema. In the 1950s I was aware of Belafonte as a singer, but for a child in the UK the politics of race in American society were not very visible. The documentary spends most of its time focusing on Belafonte’s TV career and his leading role in assembling support from other entertainers for the Civil Rights struggle of the 1960s. With his high profile in American music and television he had clout and he was prepared to put his career on the line to fight for equality. I’d not seen most of the TV and news footage presented here before so this was very exciting. My slight reservations about Sing Your Song aren’t intended to put anyone else off watching the film, which I hope will show on UK TV after its cinema run and DVD release. There is also a book, My Song and the official website for the film provides a wealth of resources. Harry Belafonte has been working in the American entertainment industry for more than sixty years and he is still active, using his resources and his celebrity status to develop political campaigns aiming to promote social, economic and political equality, both in the US and in the international arena. As many reviewers have said, he is an inspirational figure and I’m glad an accessible document like Sing Your Song exists. As well as learning about his current political work, I also learned a lot from the archive material. 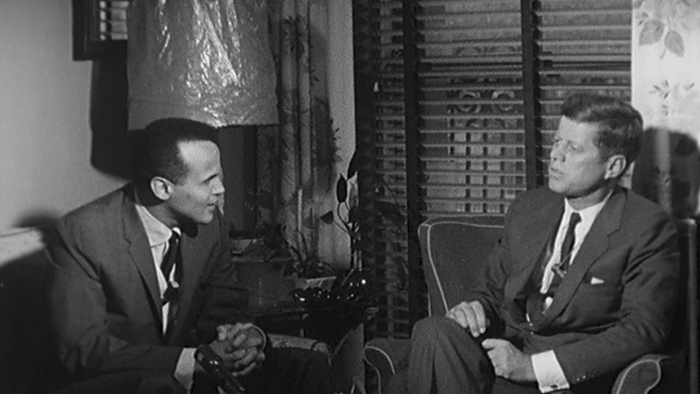 I hadn’t really appreciated just how big a musical and TV star Belafonte was in the 1950s/60s – and therefore the weight that his endorsement of causes carried. His ‘development’ of Caribbean folk tunes in an American context, though in one sense appearing ‘inauthentic’, in another sees him as opening up American popular music to new influences. But it is his strong character that enabled him to challenge the race divide in American broadcasting. 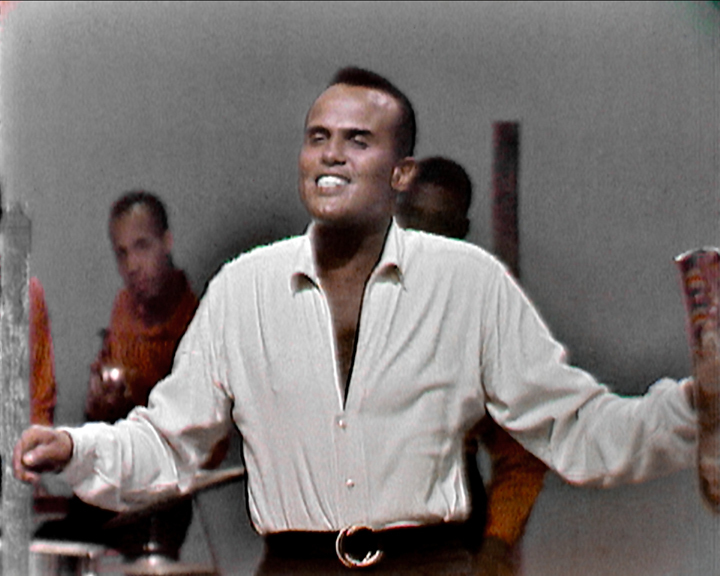 I knew about the controversy surrounding his appearance on Pet Clark’s TV Show in 1968 (when the sponsor’s representative objected to the physical contact between the two singers) but not about Belafonte’s own TV show, which was not renewed because the sponsor felt uncomfortable with its social concerns and its ‘blackness’. This morning, the Guardian‘s third editorial, often used as an ‘in praise of . . .’ piece, singles out Harry Belafonte’s book and reiterates his importance as a celebrity figure who commits completely to his political work.